Bangs and glasses are sooo cute! As an excellent example of this style, please have a look at this lady and get excited!! Sometimes we hear people say that bangs go best with light frames, and that it is better to avoid frames with thick rims, or dark colors, or those that are otherwise “heavy-looking”. I don’t agree with that. Rather than believing such general advice, I think it is more important to test and figure out what works for each of us. And testing is easy if we realize to consider each of the components of the look separately, and together with the others. - Your natural hair volume, direction and lines. – Size, style and color of the frames. – How the actual bangs are cut and then behave. – Facial shape and proportions. So the first one is about how long/much hair you have, whether it is mostly vertical and straight lines (as in the picture), or if it is wavy and wild, and also how “high” on top of your head you usually carry your do. The following is about whether the frames are statement frames drawing the attention to them, or if they are intended to blend into your overall look. The third is about how you’ve cut the bangs, the length of the bangs (whether you keep them trimmed on a regular basis :)) and if the bangs sit straight, or if they bend to either side et.c. The fourth one are the ordinary rules of thumb as come to frame size and shape if considering the shape our your head and chin. So while it is always a good idea to bring your glasses with you to the hairdressers, it is even more important to decide what kind of frames you are going to go with If you have, or can borrow an iPad, there are some great hairdo-simulation applications to help you out. In these apps you can take pictures of yourself using the iPad camera. You can then apply different ready hairstyles and colors on your pictures. Now the great part is of course that you can vary the glasses you are wearing in the different pictures. This way you get an idea of how different frames will work with your desired bangs (see for instance Hairstyle Booth HD in the appstore). That said, I usually think the easiest way to go about the frames and hairstyles matching (in app or in real life), is to start by matching the shape of your head/face with the shape of the frames. There are a lot of advice on this out there (try google or bing) so I won’t go into that here, but it is good to follow the general rules of thumb (round face -> angular glasses, oval face -> wide frames and so on). Once that is done, consider the size of the frames (both width and height). This is where you should also consider the link to the amount, height and direction of your hair. So if you have a lot of wild, high hair it is best to go with a wider, slimmer pair of frames. You may want to draw away some of the attention from your huge do, and because frames wider than your face always make a statement it is also ok to choose a more radical color. Be mindful though of the width of the rims. They better be quite slim or otherwise you are easily overdoing it. If you have neat vertical & straight hair you may want to consider an angular look, and let the geometry do it for you. In this look you would cut square-box straight bangs, and choose frames that make a straight horizontal line in parallel with the lower edge of the bangs. 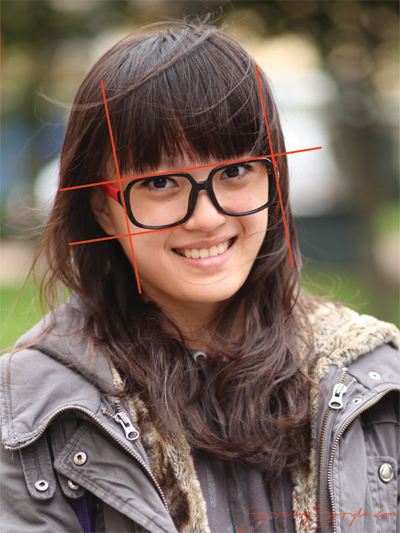 Square thick-rimmed glasses with straight bangs are usually a good mix, but it is important to check that the width of the glasses is in line with the width of your bangs. Otherwise you’ll have too many “lines” going on there Similarly, if your bangs don’t keep a straight horizontal line, or they shift to either side you may want to reconsider as the “lines” won’t be there in that case. Be sure to leave slightly less than a fingers width between the upper rim of the frames and the lower edge of the bangs to get that casual, untucked look. If the bangs hit the rims you will easily look tucked up. Now irrespective of the which way you go I think it is generally a good idea to try and match the amount of bangs and head/facial area above the upper rim of the frames to the size of the facial area below the lower rim. As you can see in the picture below, some of the reasons why the look works so good for her are the straight lines, the proper width of the frames, and the good match between facial area above and below the frames. Imagine if she would have a huge & high 1980’s style hairdo. In that case she could consider going with wider frames, slimmer rims, and lesser height on the rims to balance the amount of hair, head and face above and below the frames. So what do you think, do you like bangs and glasses? I couldn’t refrain from commenting. Perfectly written. nice post. You made some good points. Fantastic blog post, I can’t wait for the next one. Definitely, what a fantastic website and instructive posts, I definitely will bookmark your site.Have an awsome day! I added your blog to bookmarks. What i don’t understood is actually how you are not actually much more well-liked than you may be right now. Its like people aren’t fascinated unless it’s one thing to do with Lady gaga! Your own stuffs great. Always maintain it up! Great goods from you, man. Bangs and Glasses! | SmilingStyle.com I have understand your stuff previous too and you’re just too wonderful. I actually like what you’ve written here, really like what you’re saying and the way in which you say it. You make it enjoyable and you still take care of to keep it sensible. I can not wait to read much more from you. This is actually a wonderful Bangs and Glasses! | SmilingStyle.com informations. Hi, have you been accepting any advertising in your website? I’d love to buy a banner for a couple of months linking to my personal web site that is closely related. Let me know, or give me an email that I can reach you at. Thanks! This is my first time I have visited your website. I found a lot of interesting information in your webpage. From the tons of comments on your posts, I guess I am not the only one! keep up the great work. Nice writing in Bangs and Glasses! | SmilingStyle.com. I loved reading this article. If you want, check out my website. Excellent goods from you. I have understand your stuff previous to and you are just extremely great. I actually like what you have here, really like what you’re stating and the way in which you say it. You make it enjoyable and you still take care of to keep it wise. I cant wait to read far more from you. This is actually a tremendous web site. Hey. Mainly want to post and express that I valued this post. I’ll be bookmarking your website and returning to find out if you post any additional ones. Many thanks! I have been exploring for a little bit for any high quality articles or weblog posts on this kind of area . Exploring in Yahoo I eventually stumbled upon this web site. Reading this information So i am happy to show that I have an incredibly good uncanny feeling I discovered just what I needed. I most certainly will make certain to do not put out of your mind this web site and provides it a glance regularly. Hello there, just became aware of your blog through Google, and found that it is really informative. I will appreciate if you continue this in future. Cheers! I really wanted to construct a message in order to express gratitude to you for all of the splendid suggestions you are placing on this site. I feel pretty fortunate to have come across your web site and look forward to tons of more fabulous times reading here. Thanks once again for everything. Excellent blog right here! Also your web site so much up very fast! What host are you using? I wish my website loaded up as quickly as yours lol. Hiya. Just needed to submit and say that I appreciated this content. I’ll be bookmarking your website and returning to see if you post any additional ones. Thanks so much! Very great post. I just stumbled upon your weblog and wished to mention that I have really loved surfing around your weblog posts. After all I will be subscribing for your feed and I am hoping you write once more very soon! I am not sure where you are getting your information, but good topic. I need to spend some time learning much more or understanding more. Thanks for fantastic info I was looking for this information for my mission. I really neeedd to find this info, thank God!